The purpose of the Acoustical Society of America (ASA) is to generate, disseminate, and promote the knowledge and practical applications of acoustics. The Acoustical Society of America awards three finalists with cash prizes for themselves, their schools, and their mentors as well as financial support to attend the ASA next meeting. These meetings offer opportunities for students and young researchers as well as experienced acousticians to share information. The American Institute of Aeronautics and Astronautics is committed to inspiring the next generation of aerospace professionals by recognizing exceptional students at all levels. We encourage students’ progress through STEM-based educational programs, design competitions, scholarships, and awards such as the AIAA "Look Up!" Award. We will award a cash prize for the top three aerospace-related projects. We encourage students to Look Up! and see their future in aerospace. For more than 130 years, APS has powered Arizona’s growth, prosperity and innovation. Today, we provide 2.7 million people with safe, reliable and increasingly clean energy. Our 6,400 employees are dedicated to ensuring a bright energy future for Arizona. APS is excited to award three cash prizes for projects that provide scalable, real-time solutions to current energy challenges. AVASC is an educational and medical service foundation dedicated to recognizing academic talent and providing services to the needy. AVASC will award projects that display outstanding creativity, ingenuity, and have the potential to alleviate the human condition or mark a substantive advancement in the scientific field. Drexel University will award eight full scholarships valued at $200,000 each to those students whose projects match Drexel's curriculum. Drexel is recognized for its focus on experiential learning through co-operative education, its commitment to cutting-edge academic technology and its growing enterprise of use-inspired research. Drexel Co-op enables students to balance classroom theory with practical, hands-on experience. Innopolis University is a Russian higher education institution focused on education and research in the field of IT and Robotics. Innopolis University employs 81 faculty members from 22 countries.In cooperation with representatives of the real sector of economy, the University staff adapts educational programs for their needs. All education programs taught in English. King Abdul-Aziz & His Companions Foundation for Giftedness and Creativity, "MAWHIBA”, is a national educational foundation in Saudi Arabia established to help cultivate a comprehensive environment of creativity. The organization seeks to build a sustainable future by encouraging youth around the world to search for innovative means toward developing concepts in relevant fields of study. To support this goal, MAWHIBA will award prizes in four distinct categories of the Fourth Industrial Revolution (4IR) that include machine learning in real-world chemistry applications, machine learning in real-world chemistry and environmental applications, robotics and cybersecurity. A total of fourteen awards will be given to students who excel in the evaluation criteria. The Addiction Science Award is given by the National Institute on Drug Abuse (NIDA), part of the National Institutes of Health, and the Friends of NIDA, (a group that supports NIDA's mission) to three exemplary projects on the topic of addiction science. The National Oceanic and Atmospheric Administration (NOAA) is the United States government agency with a mission of science, service, and stewardship. Its mission touches the lives of every American, protecting life and property and conserving and protecting natural resources. NOAA's "Taking the Pulse of the Planet" awards recognize outstanding projects in ocean, coastal, Great Lakes, weather, and climate sciences with cash awards and a first prize summer internship. The NSA Research Directorate is one of the most established research organizations in the U.S. Intelligence Community. As a world leader in science and technology, Research engages with leading industries, universities, and national laboratories to both advance core competencies and to leverage work in overlapping disciplines. 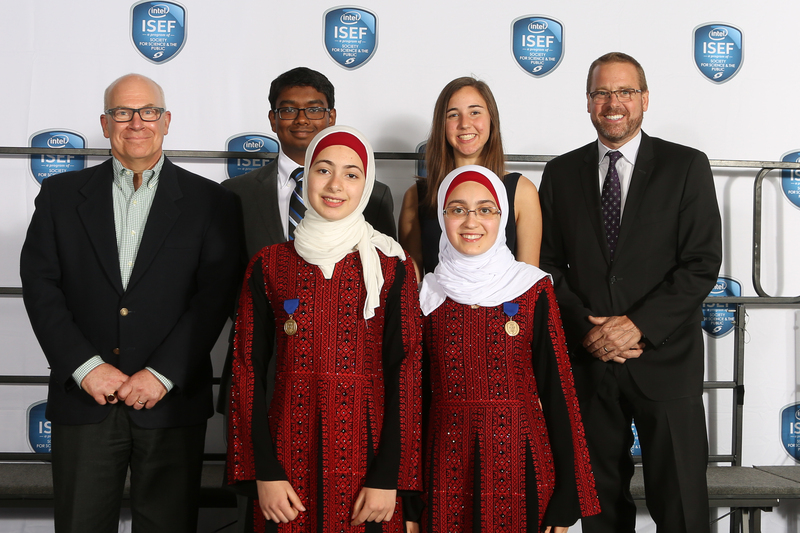 The ISEF Special Awards recognize exceptional research that demonstrates world-class skills in mathematics, computer science, cybersecurity, engineering, physics, and neuroscience while promoting research that can assure and protect cyberspace. As Oracle’s flagship philanthropic educational program, Oracle Academy advances computing education globally to drive knowledge, innovation, skills development, and diversity in technology fields. In FY 2018, Oracle Academy worked with more than 15,000 educational institutions across 128 countries, supporting 6.3 million students worldwide. Oracle Academy offers educational institutions and educators free curriculum, resources, training, cloud-hosted technology and software, support, and certification resources. The program works with public and private partners to provide the tools educators need to engage, inspire and prepare students to become innovators and leaders of the future. Through Oracle Academy, students receive hands-on experience with the latest technologies, helping make them college and career ready in the era of big data, artificial intelligence, machine learning, cloud computing, Internet of Things, and beyond. SPIE, the international society for optics and photonics, was founded in 1955 to advance light‐based technologies. The Society serves more than 264,000 constituents from approximately 166 countries, the not-for-profit society advances emerging technologies through interdisciplinary information exchange, continuing education, publications, patent precedent, and career and professional growth. United Technologies Corporation is a diversified company that provides a broad range of high-technology products and services to the global aerospace and commercial building systems industries. We are pleased to offer eight awards of $3,000 in UTC common stock for projects showing excellence in science and engineering.